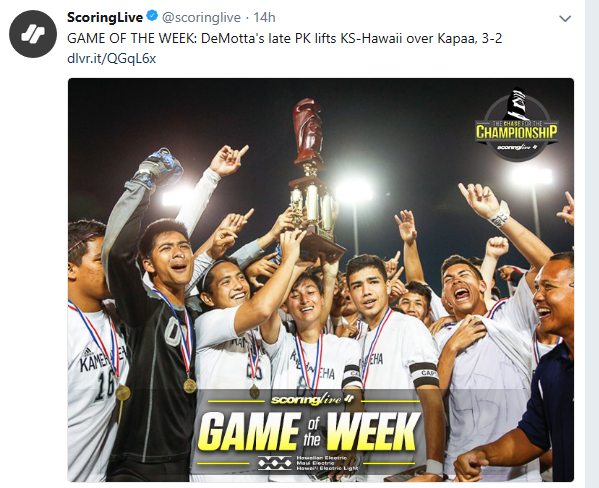 Congratulations to the KSBE Hawai’i Campus Boys Soccer Team for winning the 2018 State Division II Championship defeating Kapa‘a 3-2 at the Waipio Soccer Complex on O’ahu on Saturday, Feb. 17, 2018. Jonathan DeMotta’s penalty kick in the final minute of regulation gave the Kamehameha Warriors a 3-2 win against the Garden Isle Warriors. This is KS-Hawai‘i first HHSAA Division II state boys’ soccer crown. Twitter image via Scoring Live.